Wet specimen holder for macroinvertebrates. Wet specimens are hard to image well. This template and holder are designed to change that, and make producing high-resolution macro images simple and predictable. Provide diffuse lighting for the subject – form above or below. Keep specimen wet during the photography process. Minimize alcohol or ethanol evaporation. Provide an optical surface above the specimen to photograph through. Minimize air bubbles or pockets of air. The holder is constructed with 1/4″ marine board plastic lid, with glass window insert, and 3/4″ clear cast acrylic which is then sandblasted. A white acrylic panel is placed at the bottom of the box to provide a consistent white background and diffusion panel. Air holes in the lid allow for overspill of the liquid. Place a blob of hand sanitizer gel where you want to place specimen. Just enough to hold the specimen in place. Position the specimen in the orientation & position to photograph. Carefully fill the the box nearly to the top with ethyl alcohol (rubbing alcohol). Place the lid on the box. If the alcohol level is correct, the glass sets down into the liquid without any air pockets. Slight seepage of the alcohol through the holes in the lid is normal. Clean up surplus. Position the lights, set the Capture boundaries, check exposure and photograph! 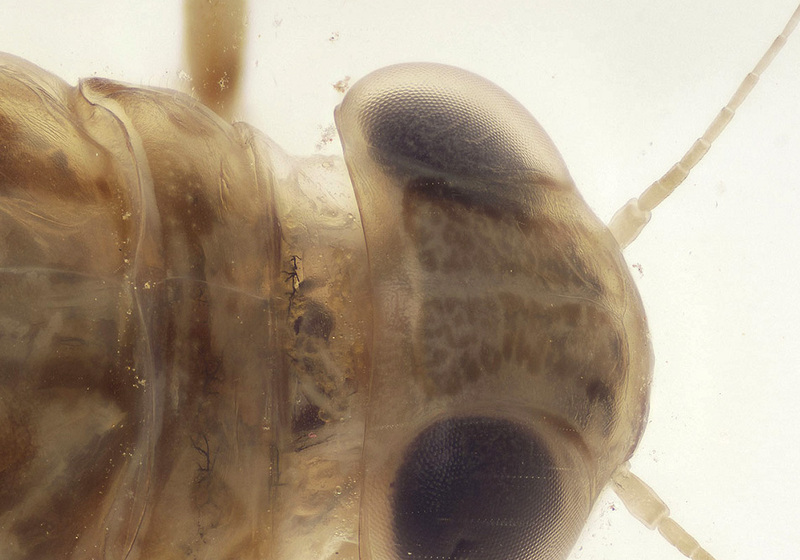 Above is a closeup (zoomed in) from the test image, a Minow Mayfly, Siphlonuridae siphlonurus. Click on the link (below) to explore the full image – please do zoom in and out and pan around! I particularly love the imaging of the ‘feathers’ on the tail parts! Check it out. The image was captured on the Magnify2 using a Nikon TM 5X lens on a Canon T5i. Just over 6,000 photographs were focus stacked and then stitched to make this 590+ megapixel resolution image. Specimen courtesy of John Wenzel and his team at the Powdermill Nature Reserve, Carnegie Institute, Pittsburgh, PA.